This box for holding tools, arrow points and other small items is carved in the shape of an unknown creature with four-fingered hands, lying on its back. On the lid is a face or mask, probably the creature’s yua – “its person” or spirit. Traditional pigments for painting boxes and masks, still used by Yup’ik artists, are made from charcoal, red ocher (an iron mineral), and white clay. Joan Hamilton: Cauga tauna? Cituaq? Neva Rivers: Cituat iingit miktut. Joan Hamilton: Caunganani? Atam tukullii. Virginia Minock: It looks like it is a fish to me. Neva Rivers: I think someone somewhere, they just make a fancy out of anything they had. Joan Hamilton: Tamkucineng-qaa pingqellallruuci? Tangerrlallruuci? Joan Hamilton: It’s beautiful. Look at all that work. Aron Crowell: It has a hand, which is interesting, there [carved on sides]. Joan Hamilton: Yes, it is like a hand. Looks like an animal’s hand. Neva Rivers: Some kind of beaver. Joan Hamilton: Atam tauna kegginaquq. Joan Hamilton: That mask is like Kacakuam piliqallruanga tamakucimek miklermini tangerrlallrua. Virginia Minock: Beads-anek pilirluni. Qatellrianek beads. Iik-am beads-aulliniuk. Neva Rivers: This is seal skin. 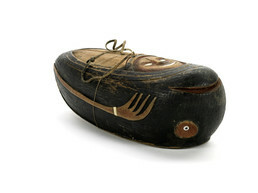 Joan Hamilton: Man’a [this one (handle on lid)], seal skin. Neva Rivers: Uiterruuq mana. Uiterruluni mana kavirliq. John Phillip, Sr.: Kangipluulria-w’ taun uitermeng ilaluni. Neva Rivers: Qatelrianeng piaqameng aumegmeng avuluki tungurituut. Urassqaneng. (When they use the white, they added their blood to it and it blackens it. John Phillip, Sr.: Kangiplugmek avuluku. Neva Rivers: Yes, that’s kangipluk [charcoal]. Ash, charcoal. Joan Hamilton: There’s couple ways of doing it. You can take white and mix it up with charcoal and make that dark. Another way is white, mix it up with blood and that becomes black too. Aron Crowell: What do you mean by white? Ann Fienup-Riordan: Urasqaq [white-gray clay], that white clay. Neva Rivers: It sticks more. Joan Hamilton: It sticks better. In fact, glue-alallrulriakut waten piluta [we would glue like this]. We used to make glue from a combination of mucous and blood. Aron Crowell: How about the red color? How would people get that nice red? Neva Rivers: Clay-at makut red-aurtaqata [these clays get red] after they burned them or cooked them. Aron Crowell: So there’s different kinds of clays that you’ve mentioned, different kinds of colors and pigments. Do people still use those? Do people still collect them? Joan Hamilton: People still use them like, for masks. Cal’ aturlarait [they still use them]. Neva Rivers: Ii-i [yes]. Mm-hmm, for their arts. Aron Crowell: Was that something that people have always traded for? Neva Rivers: Yes. They traded from other places. Joan Hamilton: Mm-hmm. Just a few places have them, coastal mainly. There was gathering of artists in March, and the artists—the Yukon people, Kuigpamiut—they traded with people from Toksook and Tununeq [Tununak], Tununermiut [people of Tununak]. Ii-i [yes], they still do that. Neva Rivers: And blue ones and red one-at-llu [ones too]. Joan Hamilton: Naken blue-ameng pilallruat? Neva Rivers: From Nelson Island.